The great lakes of eastern African are home to some of the largest and most ecologically diverse freshwater systems in the world, supporting millions of people with drinking water, food and livelihoods. 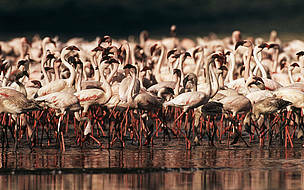 Protecting the lakes from pollution, invasive species and development is a WWF priority in Africa. Twisting down the two arms of the Great Rift Valley – the Eastern Rift Valley and Western (or Albertine) Rift Valley – one finds some of the oldest, largest and deepest lakes in the world. These include the 3 largest lakes in Africa - Victoria, Tanganyika and Malawi - as well as lakes Turkana, Albert, Edward, Kivu and several others. The lakes are important habitats for a number of fish and amphibian species, abundant birdlife and numerous crocodiles. In the surrounding lake region, one finds elephants, gorillas, hippos and other wildlife in the Great Rift's mountains and valleys. Millions of people across several East African countries depend on the lakes' resources and surrounding forests for their livelihoods and day-to-day lives. Where are the Great Rift lakes of Africa? Despite their beauty, the great lakes rank as one of the world's most endangered water systems. Deforestation, pollution from agricultural and industrial activities, run-off from urban areas and overfishing threaten the health of many of the lakes and their water basins. To ensure people and nature benefit from this truly outstanding region of Africa, WWF has designated the Rift Valley lakes as one of its priority ecoregions for conservation. WWF’s work in this region focuses on sustainable development, environmental education, and the involvement of communities in the design and implementation of conservation activities. The Rift Valley lakes are world-renowned for the diversity of cichlid fish species. Cichlids are perch-like fishes that occur only in tropical and subtropical freshwaters. The family contains more species than any other fish family - about 800 species of cichlids live in the African Rift lakes, with many more species yet to be discovered. Introduced Nile perch and overfishing, however, have led to the decrease of many cichlid species, especially in Lake Victoria. Lake Victoria, located between Uganda (southeast), Tanzania (northwest) and Kenya (southwest), is the second largest freshwater lake in the world after Lake Superior in the US and the largest in Africa. Shared by Burundi, Democratic Republic Congo, Tanzania and Zambia, Lake Taganayika is the longest lake in the world (676km) and ranks as one of the deepest (1.5km deep). It is the 2nd largest lake in Africa after Lake Victoria. Situated between Malawi, Mozambique and Tanzania, Lake Malawi (also known as Lake Nyasa), hosts the richest freshwater fauna in the world - about 14% of the world's freshwater fish species, 99% of which are found only in this lake. Lake Victoria, Lake Albert and Lake Edward empty into the White Nile.